The book starts with background chapters on the Jews, Moses, the King in the Old Testament, and moves on to the King in the New Testament (apart from John) and then reaches its main focus on the Gospel of John. "Their Lamb on the throne opened a sealed book - secret teaching - and they were originally people chosen from all the twelve tribes of Israel to receive the Name of the Lord on their foreheads (Rev.7.3-4). This vision was set in the early days of the first temple, before the kingdom divided, and it had become the hope for the future." Taken from the Introduction. 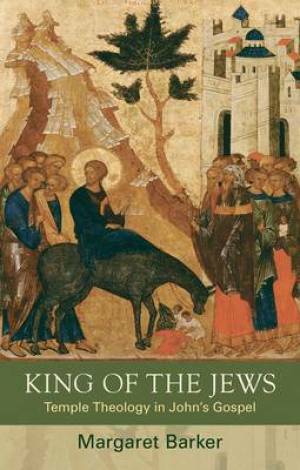 King of the Jews by Margaret Barker was published by SPCK in April 2014 and is our 69547th best seller. The ISBN for King of the Jews is 9780281069675. Margaret Barker really is one of the foremost experts these days on Temple Theology and in this 600+ page book this is largely—for want of a better description—a commentary on the Temple Theology of and in each chapter of John's Gospel. She demonstrates that expertise clearly by picking up and elucidating on key themes and motifs that may as easily be missed if you don't view the work in reference to the fact that only in John's Gospel do we meet 'Jesus the Nazarene' and the supposed gnostic elements of his gospel that actually demonstrate a much stronger reference to the Moses traditions and temple theology. Barker writes cleanly and with detail, but in a way that though detailed is so easy to understand and read. It is littered with strong references not only to the other scriptures but to the midrash, talmud and other intrinsic deeply jewish understandings that we need to understand to really understand the writing and context of the Gospel. This is a really insightful commentary but what's so good about this book is that in the first chapters you get a brilliant introduction to Temple Theology—what it is, its themes, motifs and relevance. Thus in the one book you get oversight and detail, almost two books in one. And there, in part, is the one problem with this book, because you are being charged for two books in one—at £50 this is a hefty price that sadly is going to make it one that only the exceptionally keen are likely to invest in, and that's a pity because there is much here for many people, but they are highly unlikely to pay that price for this book, even if it is worth it. Take a peek at some articles related to King of the Jews. Got a question? No problem! Just click here to ask us about King of the Jews.